No trade deal yet, the Fed downsized its 2019 and 2020 US economic forecasts, and renewed signs of a global economic slowdown—and the S&P 500 (SPX) still closed last week higher than it has on all but 78 days of its history. And that was after giving back nearly 2% on Friday. But a US yield-curve inversion2 on Friday (the 10-year Treasury rate dipped below the three-month rate), coupled with weak manufacturing data at home and abroad,3 dredged up recession talk and drove the SPX to its second-largest down day of the year. 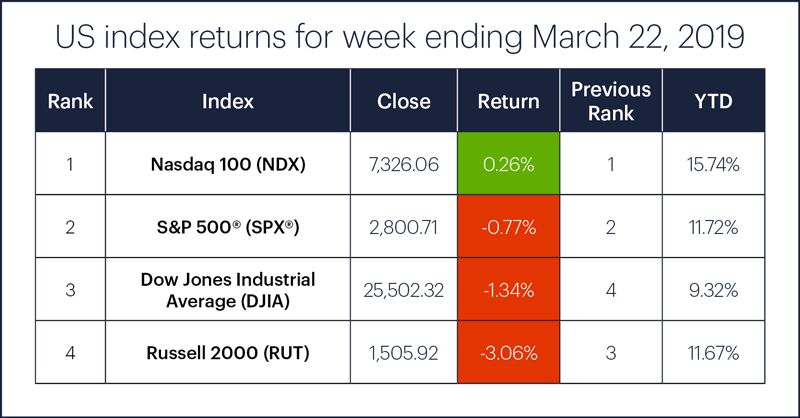 Nonetheless, the SPX enters the final week of March just 5% or so from its all-time high. Homebuilding stocks were one of the big winners in the immediate wake of the dovish Fed announcement (some held on to their gains on Friday), while financials, especially banking stocks, were notable losers. Sector action: The top-performing S&P 500 sectors were consumer discretionary (+2.6), information technology (+2.2%), and real estate (+2.1%). The worst-performing sectors were financials (-4.1%), materials (-0.4%), and industrials (-0.3%). Highlight reel: Dermira (DERM) skyrocketed +83% on Monday after the biopharma company released news of a successful trial of its eczema treatment. On Wednesday, medical device company Nevro (NVRO) surged +36% on news of a C-suite shake-up. Biogen (BIIB) tumbled 29% on Thursday after announcing it was pulling the plug on its Alzheimer’s drug, while Levi’s (LEVI) closed out its IPO day at $22.41—32% above its projected target price. Futures watch: Okay, forget about oil, gold, currencies, and Treasuries for a minute. 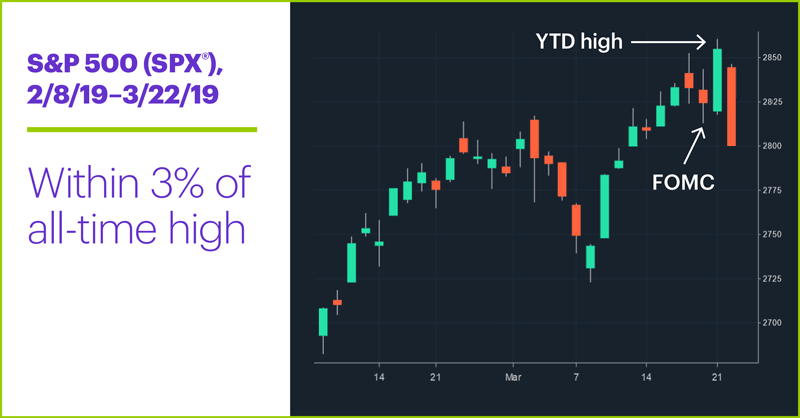 Humble hog futures continued to skyrocket last week, with the April contract (HEJ9) rallying another 17% last week (a 52% gain since February 20) before turning lower intraday on Friday. May WTI crude (CLK9) topped $60/barrel last week before Friday’s downturn pulled prices back to around $59. April gold (GCJ9) edged higher to close the week around $1,313/ounce. Go to the E*TRADE market calendar (logon required) for an up-to-date earnings schedule, along with a complete list of splits, dividends, IPOs, economic reports, and other market events. The Active Trader Commentary also lists earnings announcements and economic report times every morning. After 1% up-day/down-day combos like last Thursday-Friday, the SPX tended to close up for the next two days, then close lower the two days after that. What tended to happen next? The SPX closed up more than half of the time on the first two days after these patterns, but closed down more than half of the time the two days after that. This isn’t the only way a trader could model the Thursday–Friday price pattern, but it does represent the basic price dynamics at work: a big up day and new high that gets reversed the next day by a big down day. As always, every market situation is different, but it helps to know what the market has tended to do in the past after conspicuous price moves. 1 Reuters. Fed sees no rate hikes in 2019, plans balance sheet reduction slowdown. 3/20/19. 2 Bloomberg. U.S. Treasury Yield Curve Inverts for First Time Since 2007. 3/22/19. 3 MarketWatch. U.S. manufacturing PMI slides to 21-month low in March. 3/22/19. Wednesday’s Fed announcement hit bank shares but sent homebuilders soaring. A volume surge isn’t necessarily what it first appears to be, but that doesn’t mean there’s no trade opportunity. When do we get there?